Happy December, Dear Readers! The holiday season is officially here, and in addition to fun times with family and friends, it also means we’ll be faced with temptation in many forms. There are so many treats to enjoy in such a short month. And some of those treats come in alcoholic form. It’s easy to forget that drinks have calories, too, so here are some sensible ideas for enjoying seasonal beverages. 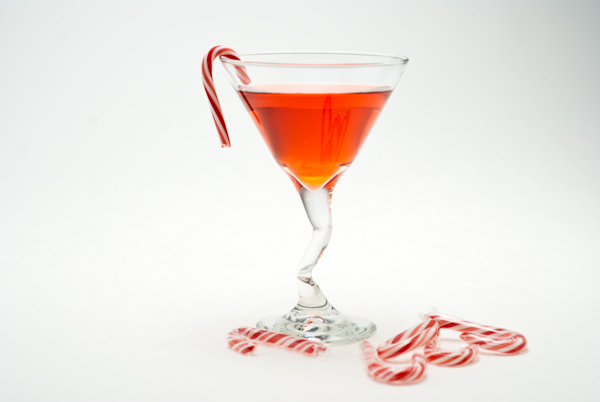 Let’s get started with a cocktail recipe for a Candy Cane Martini that we modified from a recipe that appeared in an edition of last year’s The Hill newspaper. First, you rim a martini glass with crushed/pulverized candy canes. To rim a glass, all you need to do is wet it by running a water- or alcohol-soaked paper towel around the rim. Then quickly dip the wet glass into the candy canes. Next, add a few ice cubes to a cocktail shaker and add 1 ½ ounces vanilla vodka, ½ ounce peppermint schnapps and strain into the glass. Top it off with 1 ounce of cold tonic water (or club soda, but that will make the drink even sweeter) and STIR. Learn from our mistakes and DO NOT shake the carbonated beverage! This recipe has about approximately 155 calories. Most martinis will provide 150 – 210 calories per drink, depending on mixers. Tonic water is low in calories, but to cut down further, use diet tonic instead. For our readers who are expecting or just don’t drink alcohol, we’ve got a mocktail recipe just for you. Pour one ounce cranberry juice into a martini glass, add two ounces seltzer water and top off with a splash of sweetened lime juice. Add more juice or seltzer to taste, or mix it up and add flavored seltzer instead of unflavored. As with cocktails, mocktails such as this one can be lightened by substituting reduced calorie versions of the ingredients, particularly if juice is involved (the majority of calories in this recipe will come from the cranberry juice). With juice, keep in mind the differences between 100% juice and juice “drinks” which may only be 10 – 25% juice. For more information about indulging in alcohol without overdoing it, check out our post from earlier this year. What are your favorite holiday cocktails and mocktails? How Stacey Got the Shot: On a transparent table overlaid with white paper, one light under the glass, one light above, with diffusion material in between the glass and top light, and foam core reflectors on either side of the glass. Camera set to f/4.5, focal length 50mm, ISO 100, 1/15 second exposure on a tripod. Served a great Cranberry Mojito at a dinner party this weekend (recipe adapted from the book “Mix Shake Stir”). Bring syrup, zest and cinnamon to a boil. Add cranberries until they start popping open, about one minute. Remove cinammon and mix syrup, cranberries and rum in a jar and let cool. In a shaker, muddle cranberries, liquid, mint and limes. Add ice cubes, cranberry juice and spiced rum and shake until combined. Pour into glass and finish with soda water to taste. Garnish with a few drunken cranberries. If making in high volume, these can get a little time consuming and messy. In that case I’d recommend scaling the recipe up 8x and putting it in a pitcher. Then just shake with ice and serve when needed.